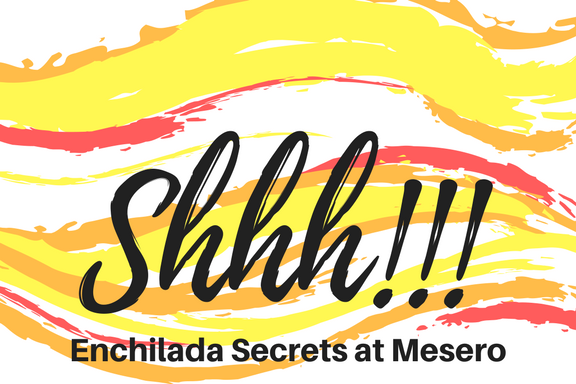 It’s no secret that our menu at Mesero is delicious—but we have heard so many times that once people try any of our enchiladas they are hooked! Maybe you want to try something different than enchiladas on our menu, but then you might get jealous (note: food envy is a real thing!!) if someone gets one of our enchiladas… and even worse if that person doesn’t even offer you a bite! We are going to break down each of our enchiladas so that you can better understand why they are so delicious. On our menu we have five different enchilada options—all of which are delicious and come with two enchiladas and rice in the meal! However, sometimes our menu might contain words that are new to you—so we are here to not only breakdown our enchiladas, but also translate what they are for you! A base of cheese enchiladas which is then doused with delicious chile con carne (translation: a delicious beef chili sauce) and then served with arroz rojo (translation: red rice). Two chicken enchiladas that are then covered with our delicious mole sauce with white rice on the side. Mole sauce is a traditionally Mexican that is based off flavors of yummy peppers, and tastes delicious on anything—especially these enchiladas. Based off two chicken enchiladas, these enchiladas are a definite favorite! The two enchiladas are then covered with a beautiful green sauce made from fresh tomatillos! We don’t stop there, either, because we then add two different cheeses (queso fresco and crema Mexicana) and then top it all off with red onion and add a side of tasty red rice! An eye-catching dish that will make your stomach happy! Two chicken enchiladas that are topped with a deliciously creamy cheese sauce called cremaqueso, and we also add cilantro cream on top of that—seriously so delicious! Lastly, it comes with a side of white rice. Our last enchilada is made up of two Chihuahua cheese enchiladas which is topped with a delicious and colorful red sauce and a slight drizzle of cilantro cream. And then served with green rice! It's like a party on a plate! So, we told you some of our secrets and gave you a more in-depth look into our enchilada options—but we can’t spill all the beans on our enchilada secrets! … Or maybe you’re hooked on one of our other dishes, we get that too! Next time you join us at any of our five locations, give our enchiladas a try! If you’re a little more conservative, you might want to try one of our “Las Combinaciones” to mix and match something you are used to and add something new—like a Tejano enchilada!